One of the most celebrated and highly decorated heroes of World War I, a noted trial lawyer, presidential adviser and emissary, and chief of Americas Office of Strategic Services during World War II, William J. Donovan was a legendary figure. 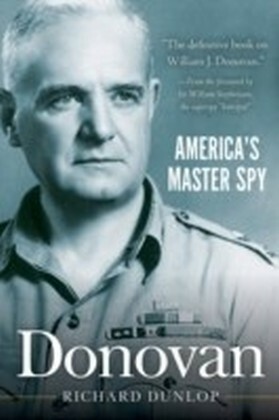 Donovan, originally published in 1982, penetrates the cloak of secrecy surrounding this remarkable man.During the dark days of World War II, Wild Bill Donovan, more than any other person, was responsible for what William Stevenson, author of A Man Called Intrepid, described as the astonishing success with which the United States entered secret warfare and accomplished in less than four years what it took England many centuries to develop.Drawing upon Donovans diaries, letters, and other papers, interviews with hundreds of the men and women who worked with him and spied for him, and declassified and unpublished documents, author Richard Dunlop, himself a former member of Donovans OSS, traces the incredible career of the man who almost single-handedly created Americas central intelligence service. The result is the definitive biography that Donovan himself had always expected Dunlop would write.